The tragic encounter between government forces and combined foot soldiers of the Moro Islamic Liberation Front and Bangsamoro Islamic Freedom Fighters in Maguindanao has not only killed nearly a hundred people from both sides. It's also starting to divide the country on what the next step should be in addressing the decades-old war and violence in Mindanao. On one side are the people wishing for the Bangsamoro Basic Law to take its course. On the other side are the people calling for an all-out war against the Muslim rebels. As the title of this article suggests, I'm obviously against declaring an all-out war. Allow me to explain why. 1. War will only mean one thing. And that is it will leave more lifeless bodies in the fields of Mindanao. Seen from all angles, an all-out war will achieve something with certainty and that is additional blood in the hands of both parties. This conflict has been going on for over three decades. Take a moment to let that sink in. If war is the answer, then this conflict would've been over by now. Well, it's not over and it's been more than 30 years since it started. It's time we look back at what transpired in the past 30 years and realize that cutting each other's throats is not the most viable solution. How many more years do we have to hunt each other down in the jungles of Mindanao before we realize that it's leading us nowhere? How many more policemen, soldiers and rebels have to die before we say "Okay, this is not good. We are running in circles and we're leaving dead bodies every time we complete a turn."? Remember when then President Erap declared an all-out war in 2000? During his two-and-a-half year presidency, Erap's war caused the deaths of 471 Moro rebels and 222 government soldiers. This is not to mention the civilian casualties. Is this something that we want to see in the year 2015 and beyond? It bothers me that a lot of people are using Erap's war as the standard on what should be done next in Mindanao in light of the recent Mamasapano encounter. I see a lot of comments online that goes, "Pulbusin na ang mga yan, gaya ng ginawa ni Erap." I'd like to ask these same people, so what did Erap accomplish after going with an all-out war? Did he establish peace in Mindanao? No. What did his war bring to Mindanao? Hundreds of government soldiers and rebels dead. Schools and houses burned down to the ground. Lives ruined. Seeds of hatred were planted for even more violence. More than 200 government soldiers died in Erap's time. That's what an all-out war costs. 2. There will be unimaginable collateral damage. Wherever there is war, there will always be collateral damage. Houses of civilians will burn to the ground. People caught in the firefights will have no choice but to pack up their things and evacuate. This will create another bag full of problems. Picture a mother holding her baby in her arms as she balances a box of clothes on top of her head. As they run towards safer grounds, the sounds of bullets and artillery follow them around. This traumatic experiences will be something they will likely live with for the rest of their lives. 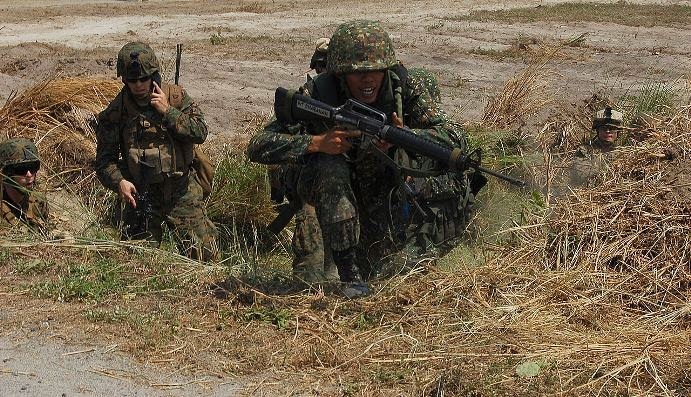 Filipino soldiers in a combat exercise with U.S. forces. Photo by the U.S. Marine Corps. Let's bring back Erap's all-out war. After he declared war on the Moro rebels and countless encounters ensued, the number of people fleeing from the conflict swelled to 800,000. That's nearly a million mostly innocent people leaving their homes. If Pnoy does what Erap did, we will be looking at a similar scenario. Tomorrow's newspapers will be plastered with pictures of crying babies, of traumatized mothers, of squalid evacuation centers, of houses smoldering from a recent fire, and guns propped up against a desk where a young Muslim boy used to do his arithmetic. In the recent Mamasapano clash, among those killed were civilians - an eight year old child, a woman, and two men. Not much is known about them because the media barely bothered to seek out their stories. We don't even know their names. 3. War will only plant seeds of hatred that will likely sprout as new wars in the years to come. Let me state something obvious that a lot of people seem to be taking for granted. The rebels killed during the Mamasapano encounter have sons, brothers, uncles, fathers, cousins, and friends. These people form a reservoir of new combatants. They may not be supporters of the insurgency but if news go around that a father, a son or a friend has been killed in battle, human nature will signal them to pick up where the dead relative left off. Who knows, the gun that used to belong to an insurgent killed during the recent encounter in Mamasapano may now be in the hands of his son, or brother, or friend. The point here is that if you go all-out against them and cut all of them down, they have sons, brothers, and relatives who will soon pick up the guns from their cold, lifeless hands. The conflict in Mindanao is a vicious cycle. Heightening the mood for war will only make things worse. The only way to bring peace in the region is to gradually slow down then eventually stop the cycle of violence. This is where the Bangsamoro Basic Law enters the picture. Many of the rebel fighters are relatives and friends to each other. They belong to clans. They come from the same villages. They want an end to this conflict as much as we do. 4) Everyone is to be blamed for the encounter in Mamasapano, not just the Moro insurgents. The blame-game and finger-pointing that has been going on after the encounter is a futile exercise. The truth is all the parties involved have blood in their hands. Several investigations were rolled to look into what really happened in Mamasapano. Until results from these investigations come up with their conclusions, we should be not too eager in spreading half-truths, conspiracy theories, and unfounded claims. In this digital age, anyone can cook up an idea, claim it to be true, and push it down everybody's throats via social media sites and blogs. This is very rampant in the Philippines. In the aftermath of the Mamasapano firefight, we've come across misleading photos, videos of shady sources, conspiracy theories, and ridiculous speculations. Did the policemen fire first? We don't know yet. Were the slain cops mutilated? We don't know yet. Were American soldiers involved in the encounter? We don't know yet. In short, there still are a lot of things that we need to know to fully understand what really transpired. To put the entirety of the blame on the insurgents is premature and dangerous. This war is not black and white. It can't be simply described as a war of "good versus evil". All sides and parties involved have skeletons in their closets. 5) The Mamasapano encounter is just the tip of the iceberg. Let us not forget that the recent encounter in Maguindanao is merely a single piece in a huge puzzle. To truly understand the conflict in Mindanao, you have to go back over four decades ago when the conflict first started. History tells us that this conflict was the product of a massacre perpetrated by the Philippine Army. Most Filipinos don't know this because this isn't taught in our schools. The Moro insurgency in Mindanao was triggered by the Jabidah massacre in 1968. In said massacre, at least 23 Muslims were executed by government soldiers in Corregidor. The number of Muslims killed range from 14 to 68. Some say it's over a hundred. For details about this incident, read this Rappler article or better yet get a copy of the book by Marites Dañguilan Vitug and Glenda M. Gloria titled Under the Crescent Moon: Rebellion in Mindanao. And then there's the battle between Moro rebels and government troops in Jolo in 1974 that led to the annihilation of around 10,000 people. More than two-thirds of the capital was razed to the ground. Many people were unaccounted for. In the words of a government employee who witnessed what transpired, "The dead were just left to decompose on the road or thrown into the sea". My point here is that we can't go to war based on our emotions alone. What happened to the 44 Special Action Force cops, the 18 Moro combatants, and the civilians caught in the middle is saddening and tragic. They all deserve justice. But before we decide to roll out with our tanks on a revenge mission, we need to put our emotions aside, review the matter at hand, learn about the things that transpired in the past thirty years, and find other ways of resolving the issue without using guns and violence. We've seen it all in the last few days. Coffins of slain policemen draped in Philippine flags. Wives, fathers, mothers, and relatives grieving over the white boxes. We will be seeing more of these if an all-out war is the route we take. Let us give the Bangsamoro Basic Law a chance. It's not perfect. It still has a lot of loose ends that need to be ironed out. Given the propensity of violence in the region because of the presence of not only one but several armed groups that often turn their guns against each other, the BBL at first glance doesn't seem to be a good choice. But it's an option that is different. One that if implemented as planned will shed less blood in Mindanao. There are among us, myself included, who have doubts in the sincerity of the rebels. That if they are to be given control over regions in Mindanao by the government, they'll start bickering among themselves and start smaller wars against each other. That it would no longer be the government versus them but them versus them. Liberation Front combatants versus Freedom Fighters. Or rebel commander versus another rebel commander. Right now, there are reported altercations among leaders of these groups. Will these go away once the BBL gets a go signal and starts rolling out in the region? It can be difficult to believe that giving the people in the war-torn region the chance to manage their own affairs will put a stop to the conflict. But what other choice do we have? The only other choice on the table is war and we all know what will happen if war has its way. For more than thirty years, we've seen what it's capable of. We've seen enough. It's time we decide that we don't want to see any more of it.